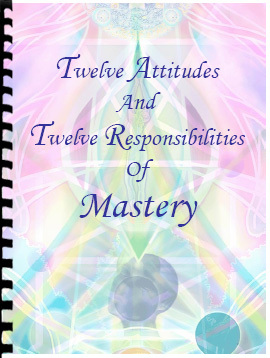 (Introduced at the Dance for Life workshop 2002) Study the 12 Attitudes of Mastery, make an affirmation meditation out of them, and try to make them your way of life. 2. GRACE - Allowing the ALL-ONE-ness to Be what IT IS regardless of whether it suits you. Living Perpetual Forgiveness. 3. GRATITUDE - Appreciating the ALL-ONE-ness; knowing your Alive-ness. 4. REVERENT - RESPECT - Acknowledging and giving to the ALL-ONE-ness. 5. RESPONSIBILITY - Co-Creating with, Serving and being able to Respond to the ALL-ONE-ness. 6. TRUST - Knowing the Power and Love of the ALL-ONE-ness. 7. ACCOUNTABILITY - Being in a state of TRUTH with the ALL-ONE-ness. 8. IMPECCABILITY - Upholding and Protecting the ALL-ONE-ness. 9. MINDFULNESS - Loving, Nurturing, and Being Attentive to the ALL-ONE-ness. 10. FEARLESSNESS - Recognizing the Eternal Infinite Nature and Unconditional Love of the ALL-ONE ness. 11. ENGAGED DETACHMENT - Permitting the ALL-ONE-ness to BE without assigning Critique Condemnation or Value Judgment; understanding the IS-ness of and Validating the ALL-ONE ness. 12. 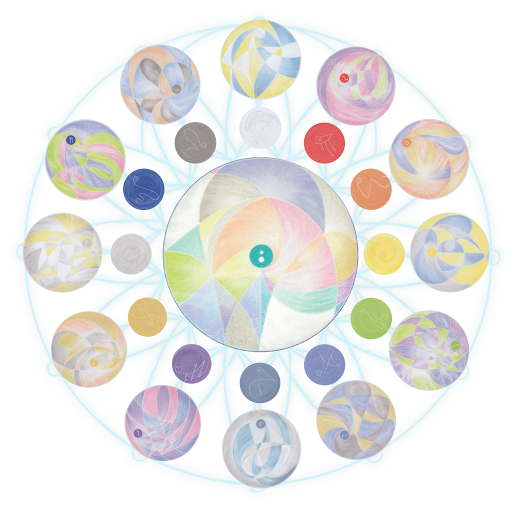 JOY - Choosing to BE the embodied ALL-ONE-ness. (2002년 Dance for Life 워크샵에서 소개됨) ‘12 마스터리의 태도’를 공부하고 명상하며 말로 진술하면서 일상의 삶의 방식이 되도록 노력하십시오. ‘가해자-피해자 비난 게임’으로부터 자유로와 지는 것입니다. 당신 삶에서 나타나는 모든 사건 현현들은, 당신 자신의 의식/DNA 형판으로부터 직접 투사된 의도된 학습(intended learning)입니다. 이를 인정하고 이에 대해 기꺼이 책임을 지는 것입니다. Freedom from the "Victim-Victimizer Blame-Game" and willingness to be accountable for all perceivable manifestations as direct projections of intended learning from the personal Consciousness/DNA Template. 다른 이들의 영적 권리를 침해하지 않으며 또한 다른 이들이 당신의 영적 권리를 침해하는 것을 허용하지 않는 것입니다. 당신은 자신이 신 영혼(God Spirit)의 현현임과, 스스로의 자유를 창조할 능력이 있는 존재임을 압니다. 그러므로 무엇으로부터든 승인받을 필요에서 자유롭고, 어떤 형태든 “외부 권위”에 저항할 필요에서 자유로와 지는 것입니다. Freedom from the need for approval from, or the need to rebel against any form of "external authority" through understanding that you, as a manifestation of the God Spirit, have the ability to create personal freedom without violating the spiritual rights of others and without allowing others to violate your spiritual rights of being. 스스로 책임감있게, 자신의 에너지를 지휘할 책임이 있음을 항상 깨닫는 것입니다. “당신을 화나게 하는” 어느 누구도, 어떤 것도 없습니다. 그러므로 반응, 생각, 의도나 행동의 어떤 개인적인 영적 남용을 합리화하지 않는 것입니다. 당신의 파워가 당신 외부에 있다고 말하는 멘탈바디(정신)의 잘못된 오해를 따르도록 감정바디를 허용함으로 “스스로를 화나게 하는 것”은 바로 당신 자신입니다. 어떤 순간에서든, 당신은 사건을 해석하는 필터로 당신이 사용할 단어, 연상, 생각을 선택할 수 있습니다. “화가 남”, “미치겠음”, “상처받음”, "이름 붙이기", "구분하고 범주화"하는 것은 의식적으로든 무의식적으로든 멘탈바디 필터들입니다. 그것은 당신의 감정바디와 신체바디의 기능을 지휘합니다. 자기 충족적 개인은 해석의 자유가 있음을 항상 인식합니다. “부정적” 경험과 그와 연관된 성난 감정의 부조화 에너지들은 사건에 대한 개인의 해석으로서만 존재할 뿐임을 압니다. 개인 에너지 지휘에 대한 책임을 소홀히 여기는 것은, 당신을 곧바로 가해자-피해자 “비난 게임”에 위치시킬 수 있습니다. 현현(삶에서 나타나는 사건들)에 대한 개인의 힘과 책임을 외부 탓으로 돌리는 사람들 가운데서만 "가해자-피해자 비난 게임(Victim-Victimizer Blame Game)"이 일어납니다. 다른 사람들이 무엇을 말하고 행동하든 상관없이 오직 당신만이 “자신을 화나게 할” 힘을 지닙니다. 그리고 당신은 자신의 해석에 대한 완전한 권리를 갖고 있습니다. 당신이 그 힘을 포기하지 않는다면 누구도 무엇도 당신을 화나게 할 힘을 갖지 않습니다. 그것이 신체적, 감정적, 정신적(생각, 신념, 이름 붙임, 해석)인 것이든, 또는 의식적, 무의식적인 것이든, 개인의 수련(연습)으로 당신의 에너지를 지휘할 수 있습니다. 우리는 "자유의지 선택"이란 선물을 받은 존재들입니다. 이 선물엔 개인의 책임이 암시되어 있습니다. 이러한 책임을 인식할때, 자기 충족이 일어납니다. 더 많이 책임질수록, 당신은 더 많은 자유와 권한을 알게 될 것입니다. Taking personal responsibility for, and realizing that at all times, you are accountable for DIRECTING PERSONAL ENERGIES. There is no one or no thing that "upsets you" and thus justifies or validates ANY personal spiritual misuse of reaction, idea, intention or action. It is YOU who "upsets yourself" by allowing the emotional body to follow misperceptions of the mental body that tell you that your power lies outside of yourself. At any given moment, you can CHOOSE which words, associations and ideas you will use as the filters through which you interpret an event. "UPSET", "MAD", HURT" or any other category of labeling (conscious or subconscious) are all MENTAL BODY FILTERS that direct emotional and physical body function. The self contained individual recognizes that at all times, the freedom of interpretation exists, and thus a "negative" experience and its associated dis-harmonic energies of "upset" feelings can only exist as a personal interpretation of events.Accepting any less responsibility for the direction of personal energies will place you directly into the Victim-Victimizer "Blame Game", which can only take place among people who are placing their personal power and responsibility for manifestation onto externalized sources. Only you have the power to "upset yourself". Regardless of what others say or do, you are fully entitled to your own interpretation. No one or thing has the power to upset you unless you give this power away. Self containment comes when one recognizes that the direction of personal energies, whether physical, emotional, mental (ideas, beliefs, labels, interpretations), conscious or subconscious is an attainable level of personal mastery and exists as an implied responsibility that comes with the gift of free will choice. The more responsible you become, the greater freedom and personal empowerment you will know. 경험하길 원하는 방향으로 당신의 에너지를 지휘하는 책임을 수용하는 것입니다. 우리의 신체바디, 정신바디와 감정바디들은 오랫동안 숨겨진 그림자(쉐도우, Shadow)의 잠재의식적 힘에 조종되어 왔습니다. 숨겨진 쉐도우는 현현하길 바라는 삶의 창조들과 반대로 작용하는 충동, 반응, 생각, 자극, 인지, 느낌들을 우리 안에서 일으킵니다. 영적 통달(마스터리)에 이르는 방법중 하나는, 우리의 마음, 감정, 신체 바디-대화를 관찰하는데 있어 의식적으로 깨어있도록 스스로를 가르치는 일입니다. 우리 안에서 자동 조종사(auto-pilot)처럼 움직이는 잠재의식의 쉐도우 에너지를 의식적으로 재조정하기 위해서입니다. 부정적인 생각 패턴이나 감정이 일어날때 “우리 자신을 알아차리는 것을” 배운다면, 우린 그 인식의 순간에 잘못된 에너지를 복권하고 긍정적인 태도의 힘, 단어를 달리해 선택하는 힘을 의식적으로 사용할 수 있습니다. 이를 통해 반대로 흐르는 에너지들을 우리가 바라는 건설적이고 영적으로 성숙한 창조의 에너지로 재조정해 낼 수 있습니다. 포효하는 잠재의식 마음의 "사자 조련사"가 되는 데는 자기훈련이 필요합니다. 우리에겐 애정 어리면서도 확고한 재조정을 통해 잠재의식 쉐도우를 "말 잘 듣는 고양이"로 진화시킬수 있는 타고난 힘이 있습니다. 변화된 쉐도우는 건설적인 공동-창조자로 우리를 돕게 됩니다. 그림자가 "저 밑에서부터" 기어올라오고 도저히 내키지 않을지라도, 우리 자신에게 "영적으로 바른" 생각과 행동, 태도를 사용하도록 부단히 상기시킬 때 자기훈련은 이루어집니다. 우리의 쉐도우 자아들은 자신안의 그림자들을 의식적 마음이 볼 수 있도록 치유를 위해 스스로를 드러냅니다. 이 과정을 통해 의식적 마음은 더 큰 배움의 영적 통달로 나아가게 됩니다. Accepting responsibility for directing personal energies toward, rather than in opposition to, the outcomes you desire to experience. The physical, mental and emotional bodies have long been directed by the subconscious forces of the hidden "shadow", creating within us urges, reactions, thoughts, impulses, perceptions and feelings that often work counter to the life creations we desire to manifest. Part of spiritual mastery entails teaching ourselves to be consciously diligent in observing our own minds, emotions and physical body-talk, so that we may employ conscious redirection of subconscious shadow energies that run on "auto-pilot". If we learn to "catch ourselves" when "negative" thought patterns or emotions run through us, we can use that moment of recognition to reclaim this errant energy and consciously use the power of affirmative attitude, remedial word choice and direct energy re-direction to direct opposing energies of the Self into fulfillment of desired constructive, spiritually mature creations. It takes self discipline to become the "Lion Tamer" of the often roaring subconscious mind, but we do have the intrinsic power to help our subconscious shadow to evolve through loving but firm redirection, into a "cuddly lap cat" that will gladly join us in our constructive co-creations. Self-discipline emerges when we consistently remind ourselves to employ the "Spiritually Correct" thought, action or attitude, even if we don't "feel like it" when the shadow sneaks up from "down under". The shadow parts of Self surface so that we may see these parts of Self come to the conscious mind for healing. Through this process, the conscious mind itself can learn greater attributes of mastery. 영혼은 매순간 우리를 통해 움직입니다. 신성한 영혼과 연결된 무한한 선물을 통해 자신을 사랑하고 보살피는 것은 스스로의 책임입니다. 진정한 사랑은 내면으로부터 나와야 합니다. 모든 창조와 본질적으로 연결된 영원한 신-자아(God-self)와의 진정한 영적 연결을 통해 진정한 사랑이 얻어질 수 있습니다. 개인의 외로움이나 내면의 결핍을 채우기 위해 "외부에서" 사랑을 찾으려 한다면 우리는 에너지 뱀파이어 관계 속으로 빠져 들게 됩니다. 다른 사람이나 존재들 안에 구현된 신근원을 이용해서, 자신과 신근원과의 연결을 대신할 무언가를 찾는 것이기 때문입니다. 그것은 사랑(Love)이 아니라 필요(Need)입니다. 이는 핵심적인 것이 "결핍"되어 있음을 암시합니다. 즉 신근원의 우주의식과 개인의 연결이 제한되어 있음을 나타내는 것입니다. 그러한 결핍은 외부의 "사랑"에 의해 채워지지 않습니다. 그것은 오직 당신 안의 신을 인식하고 당신이 절대적 사랑의 살아있는 구현체임을 인식할 때만이 채워질 수 있습니다. 이것을 인식할 때, 당신은 세상에서 가장 위대한 사랑, 신의 사랑을 지니게 됩니다. 바로 이 신성한 힘의 자리로부터, 당신은 세상으로 나아가 이 사랑을 줄 수 있는 사람들을 찾게 됩니다. 더 이상 세상에서 사랑을 '얻을 수' 있는 사람을 찾지 않게 되는 것입니다. 이러한 자기 사랑을 통해 사랑이 접근될 때, 당신은 당신이 필요한 무엇이든 당신안에서 활동하는 신근원의 사랑을 통해 현현될 수 있음을 알게 됩니다. 그러므로 당신의 동기(motive)는 오직 기쁘게 주는데 있게 됩니다. 자기사랑은 영적 성숙을 이루기 위한 우리의 책무입니다. It is our own responsibility to love and nurture ourselves through the limitless gift of Divine Spirit that moves through us at every moment. Genuine love must come from within and can only be gained though genuine spiritual connection to the eternal God-self and its inherent connection to all creation. If we seek love "on the outside" in order to fulfill a personal loneliness or lack within, we enter relationships as "energy vampires". In doing this, we are seeking a substitute for our personal God-Source connection through tapping into the God-Source embodied within other people or beings. This is not "LOVE". It is "NEED". This implies the "LACK" of something essential, which in turn implies a limited personal connection to God- Source Universal Consciousness. Such lack cannot be filled by external "love". It can only be filled by recognizing the God within you, and thus recognizing that you are a living embodiment of absolute love. Once this is recognized, you will HAVE the greatest love of all, God Love. And from this Position of Divine Power, you can go into the world seeking those to whom you can give this love, rather than seeking those from whom you can "get" love. When love is approached through Self Love, the motivation is to give joyfully, knowing that anything you might need can be made manifest through the Love of the active God-Source that you carry inside yourself. Self Love is a responsibility of spiritual maturity. 항상 영적 진실성(온전함)으로 행동하기로 선택하는 것은 절대적인 우리의 책임입니다. 설령 사람들이 당신을 형편없이 대한다 해도 다른 사람들의 영적인 권리를 알면서 침해하는데는 변명의 여지가 없습니다. 영적 진실성은 우리가 정말로 삶을 어떻게 살아가고 있는지 제대로 바라보도록 만듭니다. 우리의 식습관이 식물과 동물, 지구 왕국을 침해하고 있지는 않은가요? 우리가 선택하는 말과 행동이 다른 사람들과 생명체들에 대한 존경심을 나타내고 있는가요? 비윤리적인 행동을 변명하기 위해 적자생존의 결핍 게임을 벌이고 있지는 않은가요? 이를테면 돈문제에 있어 세금을 속여 정부에 저항하려든가, 직장에서 다른 동료보다 당신이 더 가치 있고 편애 받을 자격이 있음을 증명하려는 행동을 하고 있지는 않은가요? 비록 어떤 말이 사실이 아니고, 당신 개인의 필요나 느낌에 맞지 않음에도, 사람들의 승인과 지지를 얻기 위해 “그들이 듣고싶어 하는 말을” 하고 있지는 않은가요? 다른 사람들에게 당신의 일과 책임을 떠넘기고 있지는 않은가요? 다른 사람들을 경멸하고 착취하고 불친절하게 대하면서, 인종, 성별, 신앙, 학식, 경제적 지위와 같은 잘못된 구실들로 자신의 행동을 합리화하고 있지는 않은가요? 영적 진실성은 우리가 삶을 어떻게 살아가고 있는지 매사에 철저히 관찰하도록 만듭니다. 영적으로 부조화스러운 활동 영역을 직시하고 영적 온전성으로 이끌기 위해 삶가운데 적극적인 헌신과 규율을 채택할 것을 요구합니다. 진정한 영적 진실성이 아닌 그 어떤 변명으로든, “천국 문 (어떤 바라는 곳이든)을 통과” 할 수는 없습니다. 영적 진실성을 배양하는 것은 영적 통달의 길에서 주된 책임이며 우주가 작동하는 방식입니다. 영적 진실성이 없이 우린 고향에 갈 수 없습니다. 영적 진실성에는 생물학적 실재가 있습니다. 즉 의식의 집중과 의식 상태의 결과로서 영적 진실성은 DNA 에 화학적으로 나타납니다. 당신 의식에서 충분한 양의 영적 진실성을 보유하지 못한다면 당신의DNA형판 역시 그럴 것입니다. 설령 “다른 사람들의 눈을 속일 수” 있을지 몰라도, 당신의 생물학은 결국 당신 자신의 감독관이 될 것입니다. 스타게이트를 통과하기 위해서는 충분한 양의 화학적으로 암호화된(encoded) 영적 진실성이 필요합니다. It is our absolute responsibility to chose to act with spiritual integrity at all times. There is no excuse to knowingly violate the spiritual rights of others, regardless of how poorly they may react to you. Spiritual Integrity requires that we begin to LOOK AT what we are REALLY doing in the way we live our lives. Do our eating habits violate the plant, animal or Earth kingdoms? Do our choices of words and actions show respect for other people and other life forms? Do we "play the survival of the fittest" lack-game to give ourselves an excuse for unethical behaviors in money matters, such as showing our silent rebellion against the government by trying to "cheat" on taxes, or by "showing up" a fellow employee at work to prove you are more worthy and thus more entitled to favor? Do you "tell people what they want to hear" in order to gain their approval and support, even if it is not fully true and does not reflect your personal needs or feelings? Do you try to "get others to do your share" as far as work or responsibilities? Do you use erroneous excuses such as race, gender, creed, academic or economic status to justify disrespectful, exploitative or unkind treatment of others? Spiritual Integrity requires that we take a good hard, frequent look at how we conduct our lives, to face the areas of activity in which we are performing in less than spiritually congruent ways and to employ active commitment and discipline to bring these areas of our lives into Spiritual Integrity. One does not "get through the gates of Heaven" (or anywhere else desirable) through using excuse for not employing genuine, not feigned, Spiritual Integrity. Cultivating spiritual integrity is a major responsibility on the path of spiritual mastery, and the way the universe works, you "can't leave home without it". This means that there is a biological reality of spiritual integrity that manifests chemically within the DNA as a result of that state and focus of consciousness. If you do not possess a sufficient amount of spiritual integrity in your consciousness, neither will your DNA Template. And though you might be able to "pull the wool over the eyes of others", your own biology will be eventually be your own task master. Passage through any star-gate requires a sufficient amount of chemically encoded spiritual integrity of consciousness. 오늘날 우리 사회는 우리에게 “더 원하고”, “더 필요로 하고”, “더 나아지고”, “더 많이 하라"고 끊임없이 가르칩니다. 우리는 더 구매하고, 더 일하고, 더 많은 세금을 내고 “착하고 소심한 양떼 소비자”로 살도록 지속적인 동기부여를 받습니다. 그래서 우리는 자신에게 부족한 것들을 인식하는 자극 안에서 살아갑니다. 아주 드물게도 우리는, 삶과 자유 의지 선택이란 선물에서 시작해, 진정 우리가 가진 모든 것을 생각하기 위해 멈추지 않습니다. 우리의 지각필터는 혼란스러워 집니다. 이를 통해 우리는 “완전히 진행된” 의식의 돌연변이를 키울 수 있습니다. 돌연변이 된 의식상태에서 우리는 “누군가 나에게 빚지고 있다” (신, 우주, 우리 부모, 배우자, 아이들, 고용주, 정부 등등), “나는 ~할 자격이 있다”고 믿기 시작합니다. “당신은 내게 빚지고 있다, 내가 당신에게 받을 것이 있다”는 마인드 덫에 빠지게 되면, 우리는 인생과 다른 사람들과 우리 자신에게 비현실적이고 사실이 아닌 기대를 걸게 됩니다. 그리고 계속해서 스스로 만들어낸 좌절감에 빠지게 됩니다. 또한 내가 상상하는 “그림” 대로 우주가 움직여지지 않을 때 성질을 부리거나 상처를 받기도 합니다. 그러나 아무도 당신에게 무엇을 해줘야 할 의무는 없습니다! 만약 “받아야 할 것이 있다”라고 느낀다면, 당신은 결핍 의식을 향유하는 것이며 자기안의 공허를 인정하는 것입니다. (은행과 많은 경우, 부모, 배우자, 애인들이 그러하듯), 받기 위한 목적으로 다른 사람에게 준다면, 그리고 마땅히 받아야 할 것으로 기대되는 것을 그들이 "되갚지"않을 경우, 우리는, 속았다, “이용” 당했다…“받을 것이 있다”…라고 느끼게 됩니다. 어쩌면 이러한 상황들은 주는 것은 주는 것 자체로 이루어져야 한다는 교훈을 가르치기 위한 레슨으로 우리 삶에 나타나는 것일 수 있습니다. 주는 기쁨을 위해, 주고 싶어서 줄 때, 우리는 받아야 할 빚이 있다고 느끼지 않습니다. 우리가 삶의 기쁨을 위해서 살아가되, 요구나 기대를 삶에 강요하지 않는다면, 삶이 나를 괄시한다고 느끼지 않을 것입니다. 이웃이 무엇을 가졌는가는 중요하지 않습니다. 얼마나 잘나가는지 서로를 비교하게 됨으로써, 우리는 사실상 자신이 가진 축복들을 보고 활용하는 것에서 계속 멀어지게 됩니다. 우리가 가장 작은 선물, 축복, 제스처에도 감사할 수 있는 힘을 키우기 위해 노력한다면, 우리는 “반이 비어있는”것이 아닌 “반이나 차 있는” 삶을 창조하기 시작할 것입니다. 우주 물리학 측면에서, 당신이 주의를 집중하는 것은 확장되고 당신이 저항하는 것은 지속됩니다. 당신이 감사의 에너지를 주지 않는 것은 결국 당신 경험으로부터 “발현되지-않게(de-manifest)” 될 것입니다. 당신이 진정 "주고자 하는" 선택 필터로 세상에 접근할 때, 당신은 당신 주변 세상으로 에너지를 보내는 “전기 발신체(electrical transmitter)”가 됩니다. 당신이 이러한 전기 에너지를 내보낼 때, 당신은 보다 “자기적(magnetic)”이 되어 갑니다. 밖으로 내보내는 에너지가 당신의 카타라 해부체의 다이오딕 그리드에 자기적 보텍스(에너지 소용돌이)를 형성하기 때문입니다. “자기적이 된(magnetized)” 다이오딕 지점은, 줌(giving)으로서 생긴 에너지 공백을 채우기 위해, 표현된 에너지보다 더 많은 고주파수와 양질의 우주 에너지 공급을 끌어들이게 됩니다. 그러나 당신이 세상을 “받으려는” 자세로 접근할 때 이러한 자연 물리학은 역전됩니다. 당신이 외부 세계에서 에너지를 끌어당기기 위해 노력할수록 당신의 에너지는 다이오딕 그리드에 미아즘(miasm)으로 고착되게(stuck) 됩니다. 미아즘은 우주적 공급으로부터 당신이 내적으로 끌어올 수 있는 자연 에너지 주파수를 점차 낮추어 가고 양을 감소시켜 갑니다. 가장 단순한 형태의 감사일지라도, 주는 것은 에너지의 자연적인 흐름을 지속하게 합니다. 당신이 나눠주는 무엇이든 증폭되어 당신에게 되돌아 올 것입니다. 이는 반대로도 작용합니다. 에고, 자만, “쓰레기”의 나쁜 자세로 나누어 주는 것은 당신의 길에 같은 흐름을 일으킬 것입니다. 당신이 가진 것에 감사하십시오. 그것을 사랑하고, 그것이 주는 기쁨의 관점을 발견하십시오. 진정으로 감사하는 행위 자체에서 당신은 당신이 원하는 바를 현현할 수 있는 힘을 발휘하게 될 것이고 동시에 결핍되었다는 착각을 줄여나가게 될 것입니다. “우주는 내게 빚지고 있다.”라는 마인드 덫은 세상에서 가장 강력한 자기-파괴 게임의 하나입니다. 그것을 한결 같은 감사와 바꾸면 당신의 세계는 당신이 가장 원하는 것들의 현실을 보유할 수 있도록 점차 확장될 것입니다. 세상에게 이용당했다고 느끼거나 당신 바램이 채워지지 않았다고 분노한다면 당신은 스스로에게 무언가를 빚지고 있는 것입니다! 당신은 또한 창조의 본성(nature)과 생명 창조 게임 안에서 당신 개인의 힘을 더 바르게 사용하는 빚을 스스로에게 지게 되는 것입니다. 당신이 무엇에 감사해야 하는가, 기억하는 것을 돕기 위해, 신근원(God Source)에게 감사합니다…라고 좀더 자주 말하십시오. 그러면 감사할 더 많은 것들이 당신의 여정(way)으로 보내질 것입니다. Our present society continually teaches us to "want more", "need more", "be more", "do more" etc. We are constantly influenced to perceive what is lacking in order to motivate us to buy more, work more, pay more taxes and be "good little consumer sheep". Very rarely do we stop to think about all that we DO have, beginning with the gift of Life and mental free will choice. Through this disoriented perceptual filter we can cultivate a ‘full-blown‘ mutation of mental consciousness. In this mutated consciousness, we begin to believe that "we are entitled", that "someone OWES us" (GOD, the Universe, our parents, spouse, children, employer, government, etc....). Once we fall into this "You OWE me" mind trap, we set ourselves up for continuing self-created frustration, as we place unrealistic and untrue expectations upon life, others and ourselves. We can also often get mighty angry or hurt when we find the universe doesn't conform to our imagined "pictures". No one OWES us anything! If we feel we are "owed", then we are entertaining LACK CONSCIOUSNESS and a void within the Self is being recognized. If we give to another in order to RECEIVE for ourselves (such as do banks, and often parents, spouses or lovers), and the other does not "pay back" what we expected to receive, we may feel cheated, "taken advantage of", or "owed". Perhaps these situations emerge in our lives as lessons to teach us that giving should be done for the GIVING ALONE, and not for the expected return. If we give what we desire to give, for the joy of giving, we do not feel owed. If we live for the joy of living, without forcing our demands or expectations upon life, we will not feel that "life has short changed us"! It matters not what your neighbor possesses, because in comparing ourselves to each other to see how we "measure up" to each other, we are in effect, continually being distracted from seeing and utilizing the blessings that are our own. If we can work to cultivate the ability to APPRECIATE even the smallest of gifts, blessings and gestures, we will begin to create a life that is at least ‘half full‘ instead of ‘half empty‘. In terms of universal physics, what you focus your attention upon expands, what you resist persists and what you do not give the energy of appreciation to will eventually de-manifest right out of your experience. When you approach the world through the chosen filter of genuine GIVING, you are in effect, being an ‘electrical transmitter‘, sending energy out to the word around you. When you release electrical energy in this way, you become more ‘magnetic‘, as the sending out of energy creates magnetic vortices within the Diodic Grid of your Kathara anatomy. The "magnetized" Diodic points then draw in more universal energy supply, at a higher frequency and quality than the expressed energy, to re-fill the energy void created by the "giving". When you approach the world with the attitude of "getting", this natural physics process becomes inverted. The more you try to "pull" energy from the outside world, the more your energy becomes "stuck" in the Diodic Grid as miasms. The miasms progressively reduce the quantity and lower the frequency of the natural energies you can internally draw from the universal supply. Giving, even in its simplest form of giving appreciation, keeps the natural energy flow moving. Whatever you give out will return to you amplified. This also works in reverse however, and giving out a bad attitude of ego, arrogance and ―garbage‖ will cause more of the same to flow your way. Appreciate what you have. LOVE IT, find perspectives through which the joy of it can be known, and know that in the act of genuine appreciation itself, you will set loose the powers of manifesting more of what you desire and less of the illusion of lack. The "Universe Owes Me" mind trip is one of the most powerful self-sabotage games in the world. Trade it in for consistent appreciation and your world will progressively expand to hold the reality of the things you most desire. If you feel put upon by the world, and resentful for having your desires unmet, YOU OWE YOURSELF SOMETHING! You also owe yourself a greater understanding of the nature of creation and better use of your personal power within the life creation game. SAY THANK YOU to the GOD SOURCE more often, to help yourself remember what things you have to appreciate, and many more of the kind will be sent along your way. 신근원은 자신의 일정이 있습니다. 당신은 현현이 일어나는 본질적인 현실을 인정하고 당신 내면에 거하는 신근원과 함께 공동 창조작업을 선택할 수 있습니다. 당신과 우주가 완벽한 한 쌍을 이루어 “신성의 정확한 시간”을 창조하고 있음을 신뢰하는 것입니다. (Divine Right Timing: 신성의 정확한 시간, 만약 그것이 ‘지금’ 일어나지 않는다면 거기엔 매우 타당한 이유가 있는 것입니다) 아니면 당신의 에고자아가 시간의 본질에 자신의 의지를 강요하게 할 수도 있습니다. 만약 시간이 당신의 기대에 협력하지 않는다면 “마음을 편히 갖고 DRT(신성의 정확한 시간)이 있음을 신뢰” 하거나 아니면, 인위적 시계에 집착하면서 스스로를 좌절시킬 수도 있습니다. 내가 원하는 것이 요구하는 때에 나타나지 않았다는 이유로 나는 원하는걸 가질 수 없는 사람이라고 믿을 수도 있습니다. 당신이 느긋해지는 것을 배우고, 우리가 원하는 대부분은 "신성의 정확한 시간(Divine Right Time)"에 "신성의 정확한 질서(Divine Right Order)"안에서 이루어진다는 것을 깨닫는다면, 우린 시간 의식과 공동-창조적으로 일하는 것을 배울 수 있습니다. 특히 “요구(Demand)”가 아닌 정중하게 요청할 때, 그리고 공동 창조에 있어 신근원의 역할을 신뢰한다면, 삶은 점차 우리 희망에 부합해 갈 것입니다. 인내는 우주 질서의 본질에 대한 우리의 이해를 반영하는 미덕입니다. God-Source has its own schedule! We can either acknowledge this intrinsic reality of manifestation and choose to work co-creatively with the God-source within, trusting that together, you and the universe create the perfect double “Divine Right Timing” (and if that is not “Right Now,” there IS a very good reason for this,) or you can let the ego-self try to force its will upon the intrinsic nature of time. If time does not cooperate with your expectations, you can “let that be OK, and trust in Divine Right Timing” or you can progressively frustrate yourself with attachment to the artificial time of clocks, and choose to believe that you cannot have what you desire just because it does not appear when you demand. If we learn to relax, and realize that most things we desire we can indeed achieve in Divine Right Time and Order, we can learn to work co-creatively with the consciousness of time. We will often then find that our lives will progressively better conform to our wishes, especially when we ask nicely rather than DEMAND, and also when we trust the Universal God Source to do its part in our co-creation. Patience is a virtue that reflects our comprehension of the nature of Universal Order. 존중과 마찬가지로 친절은 타고난 권리(생득권)입니다. 그러나 자주 간과되고 잘못 이해되곤 합니다. 친절의 진심어린 마음으로 세상에 다가가고, 만물가운데 살아있는 신의 힘(God Force)을 경외하는 마음으로 모든 피조물에게 사랑과 존중을 보낼 때, 우리는 높은 주파수의 전기 에너지를 전송하는 것입니다. 우주 물리학의 역학을 따라서, 우리가 내보내는 에너지는 우주 역류를 통해 우리에게 더욱 풍부한 같은 에너지를 돌려주게 됩니다. 다른 존재들에게 줄 수 있기 위해서, 반드시 우리 자신에게 먼저 주어야 할 선물이 친절입니다. 친절은 양심적인 되는 것이며, 자신과 다른 이들이 필요로 하는 것, 느끼고 원하는 것들을 살피는 것입니다. 이러한 관심과 배려를 행동으로 태도로 의도로 표현하는 것입니다. 당신 자신에게 임의로 친절을 베풀고, 당신의 길을 지나는 모든 사람들에게 이 선물을 전하십시오. 심술궂고 불평많은 이웃에게 친절하려 노력한다면, 당신은 그들이 웃는 능력을 재발견하도록 도울 수 있습니다. 당신이 모든 존재들을 친절하게 대한다는 것은, 당신이 그들의 본질적 가치를 신근원의 현현으로 인식하고 있다는 것을 보여주는 것입니다. 당신은 종종 신근원이 사랑으로 보답하는 것을 발견하게 될 것입니다. Like respect (Dance for Life Attitude of Mastery #4), kindness is a birthright, but one that is quite often overlooked and misunderstood. When we approach the world through genuine kindheartedness, and sending Love and Respect to all of creation in order in honor of the God Force that lives within all things,we are, again, transmitting electrical energy of a higher frequency that will follow the mechanics of universal physics to bring more of like kind back to us through universal back flow. Kindness is a gift we must first give to ourselves do in order to have it to give to others. Kindness implies being conscientious and caring toward the needs, feelings and desires of both the self and others, and to express this concern and caring in action, attitude and intention. Give to yourself random acts of Kindness, then pass along the gift to all who cross your way. Try being kind to the mean and grouchy neighbor and you may help them rediscover the ability to smile. When we treat all things with Kindness, we demonstrate that we acknowledge their intrinsic value as manifestations of God-Source, and you will often find the God-Source lovingly returns the favor. 보존은 모든 표현에 깃든 신-근원 에너지를 향한 존경과 감사의 한 형태입니다. 자연 자원을 아끼고 보호하는 것에서부터 우리 몸이 필요로 하는 것들에 세심한 주의를 기울이고, 우리가 필요한 것을 자유롭게 사용하되 과하지 않게 절제하는 온화한 보존(gentle conservation)으로, 우리 말과 행동의 에너지를 사용하는 것입니다. 신-근원은 새로운 표현의 재탄생을 위해 에너지를 계속해서 순환시킵니다. 모든 것이 자유롭게 주어지지만 어느 것도 무가치하거나 낭비되는 것은 없습니다. 신-근원이 우리에게 제공하는 창조적인 에너지의 선물에 대해 존경과 감사를 보이는 것이 보존입니다. 우리가 존경과 명확한 의도를 가지고 모든 형태의 에너지를 사용하는 것을 배울 때, 우리는 우리가 원하는 것을 창조할 수 있는 능력을 세밀하게 조율할 수 있게 됩니다. 이 과정에서 다른 모든 생명체들도 똑같이 할 수 있도록 도울 것입니다. “낭비하지 않으면 아쉬운 일도 없을 것이다"는 속담은 진실입니다. 우리 삶의 홀로그램에서 우리가 지각하는 모든 것이 신근원의 현현임을 이해한다면, 우리는 에너지의 신성함을 사용하고 적용하는데 있어, 좀 더 존경과 감사를 표현하고 보전하기 위해 노력할 것입니다. Conservation is a form of Respect and Appreciation for God-Source energy in all of its expressions, from conserving and protecting our natural resources, to being attentive to the needs of our bodies, to using the energies of our words and actions with gentle Conservation by which we freely use what is needed, but not more. God- Source continually recycles its energies for the rebirth of new expression. All is given freely, but no thing is valueless or wasted. Conservation demonstrates that we have respect and appreciation for the gift of creative energy that God-Source has provided to us.As we learn to use this energy, in all its forms, with respect and clear intention, we will progressively fine-tune our ability to create what we desire, and in this process assist all other beings to do the same. There is truth in the old saying “Waste Not, Want Not.” If everything we perceive in our hologram of life is understood to be manifestations of God-Source, we might all employ a bit more Respect, Appreciation and Conservation toward the use and applications of the energies of the Divine. 외교력은 반대 세력들간의 가교 역할을 할 수 있습니다. 그를 통해 각 관점을 서로 뒷받침하기 위한 효과적인 행동과 결정을 내릴 수 있습니다. 우리는 정중하게 동의하지 않는 것에 동의하는 법을 배울 수 있습니다. 공동-협력의 영적 예술은 점차 더욱 높은 수준의 표현으로 진화 할 수 있습니다. Existence is and will always be a co-creative endeavor. We must be willing to allow other beings the fulfilment of their needs and desires if we hope to have our fulfilment known. Creating “Win-Win” situations and creating with the intention of GIVING genuinely are natural ways of being. We might not always agree with the intended creations of others, and we all have a right to our points of view. Diplomacy can be a bridge between forces of opposition, through which effective actions or decisions can be reached to mutually support each perspective. We can learn to agree to disagree respectfully, so the Spiritual Art of Co-operative can progressively evolve to higher levels of expression. 영적인 지식에 대한 '상식'과 '비상식' 을 식별하고 적절히 적용하는 것을 배우는 것은 우리 삶의 모든 측면에서 에너지 표현의 균형을 가장 잘 확립할 수 있게 해 줄 것입니다. Learning to identify and appropriately apply both “Common Sense” and the “Uncommon Sense” of spiritual knowing will allow us to establish the greatest balance of energy expression within all aspects of our lives.